WordPress is currently the most popular content management system (CMS) in the world. It allows you to easily set up flexible blogs and websites on top of a database backend, using PHP to execute scripts and process dynamic content. WordPress has a large online community for support and is a great way to get websites up and running quickly. In this guide, we will focus on how to get a WordPress instance set up and running on Ubuntu 14.04 using the OpenLiteSpeed web server. Before you begin this guide, there are some important steps that you must complete to prepare your server. We will be running through the steps in this guide using a non-root user with sudo privileges. To learn how to set up a user of this type, follow our initial server setup guide for Ubuntu 14.04. This guide will not cover how to install OpenLiteSpeed or MySQL. You can learn how to install and configure these components by following our guide on installing OpenLiteSpeed on Ubuntu 14.04. This will also cover the MySQL installation. Finally, if you are using a server with less than 1 Gigabyte of RAM, you should create and enable a swap file. Learn how to do this by running through this guide. When you are finished preparing your server using the guides linked to above, you can proceed with this article. We will start by creating a database and database user for WordPress to use. You will be prompted to enter the MySQL administrative password that you selected during installation. Afterwards, you will be dropped into a MySQL prompt. 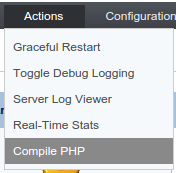 With our database configured, we can go ahead and shift our focus to configuring PHP. A customized version of PHP is included with the OpenLiteSpeed installation. However, the included version does not have the PHP extensions we need compiled in. Due to the way that the interpreter ties into the OpenLiteSpeed web server, we will need to recompile a custom version of PHP with the modules we need. If prompted, log in using the username and password you configured for OpenLiteSpeed in the installation tutorial. 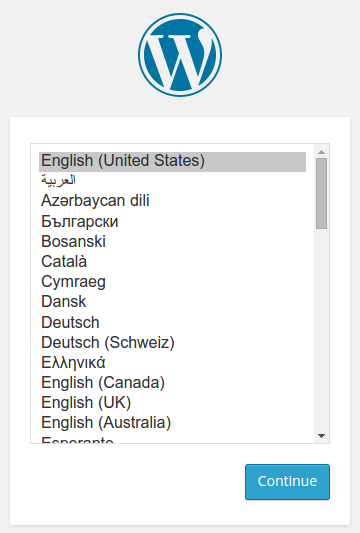 Select the most recent version out of the "PHP 5" selection menu. This should be already be preselected, but it doesn't hurt to check. Click on the "Next" button in that row to continue. Click on the "Build PHP [version number]" button at the bottom when you are finished. If the preparation completes successfully, click on the "Next" button to continue to the compilation process. The compilation process can take quite a long time (anywhere from 5 to 20 minutes). When it completes, it will automatically link to the correct location so that it will be enabled on the next restart. Before we restart though, we will configure some aspects of our virtual host to prepare for WordPress. We will be modifying the default virtual host that is already present in the OpenLiteSpeed configuration so that we can use it for our WordPress installation. This will allow you to edit the configuration of your virtual host. To start, we will enable index.php files so that they can be used to process requests that aren't handled by static files. 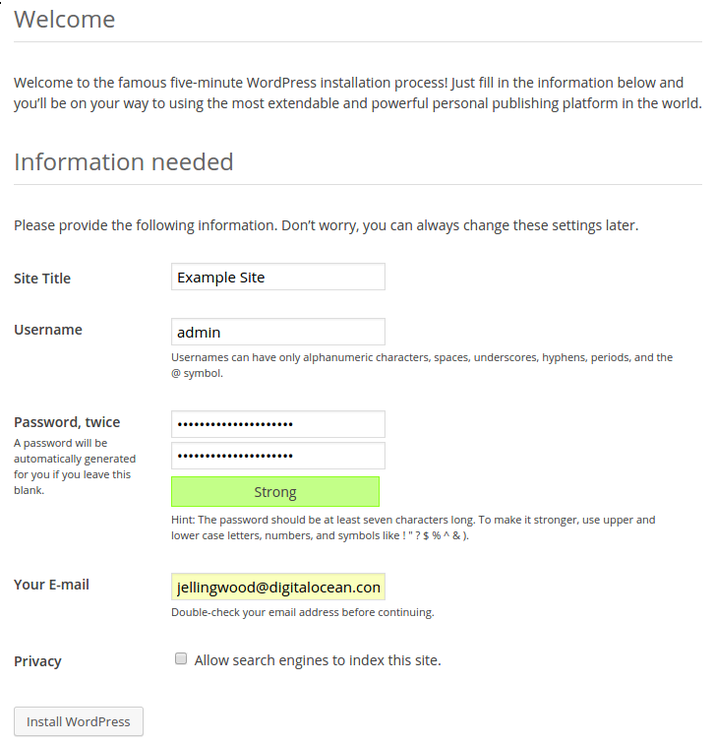 This will allow the main logic of WordPress to function correctly. Next, we will set up the rewrite instructions so that we can use permalinks within our WordPress installation. Click on the "Save" button to implement your new rewrite rules. The default virtual host that is included with the OpenLiteSpeed installation includes some password protected areas to showcase OpenLiteSpeed's user authentication features. WordPress includes its own authentication mechanisms and we will not be using the file-based authentication included in OpenLiteSpeed. We should get rid of these in order to minimize the stray configuration fragments active on our WordPress installation. Again, you will have to confirm the deletion by clicking "Yes". You can safely delete any or all of the other contexts as well using the same technique. We will not be needing them. We specifically delete the /protected/ context because otherwise, an error would be produced due to the deletion of its associated security realm (which we just removed in the "Security" tab). With all of the above configuration out of the way, we can now gracefully restart the OpenLiteSpeed server to enable our changes. Once the server has restarted, click on the "Home" link in the menu bar. Any errors that have occurred will be printed at the bottom of this page. 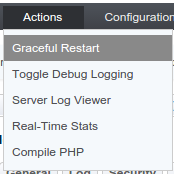 If you see errors, click on "Actions" and then "Server Log Viewer" to get more information. The last thing that we need to do before installing and configuring WordPress is clean up our virtual host and document root directories. As we said in the last section, the default site has some extraneous pieces that we won't be using for our WordPress site. You may see a warning about not being able to remove fastcgi-bin/*. This will happen if there was nothing present in that directory and is completely normal. We now have a clean place to transfer our WordPress files. We need to find the settings for DB_NAME, DB_USER, and DB_PASSWORD so that WordPress can authenticate and utilized the database that we set up for it. Make your selection and click "Continue". Your WordPress installation should now be complete. In this guide, we've installed and configured a WordPress instance on Ubuntu 14.04 using the OpenLiteSpeed web server. This configuration is ideal for many users because both WordPress and the web server itself can mainly be administered through a web browser. This can make administration and modifications easier for those who do not always have access to an SSH session or who may not feel comfortable managing a web server completely from the command line.